With the Winter Career Fair rescheduled for next week, here are some tips for preparing in advance. 1) Research the organizations ahead of time so you are prepared to have meaningful conversations with the recruiters. You can ask insightful questions based on what you know about the organization, and to have them help fill in any gaps about the company, department, or opportunities. Also, if you know about the orgs in advance you will also be able to describe your previous experiences in ways that will resonate with them. View the organizations who have already registered by logging into Go IRISH. 3) When you first arrive at the fair, don’t talk to your dream org first. Instead, have 1-2 warm-up conversations with other organizations that might interest you but where it’s ok if you fumble through a story or two. Then, once you’re confident and ready, approach your top organizations. 4) After you have met everyone you researched ahead of time, spend the rest of the fair looking at the displays of the other organizations with fresh eyes. You never know who might catch your attention that you didn’t notice from the list of companies ahead of time. It’s fine to approach these orgs to learn more about them, you just won’t appear quite as prepared as for the others. That’s fine, too. 5) Don’t be surprised if the recruiters don’t know about their organization’s graduate student level opportunities. Notre Dame is well known for its undergrad programs, and therefore many organizations target their undergrad opportunities when coming to our campus. 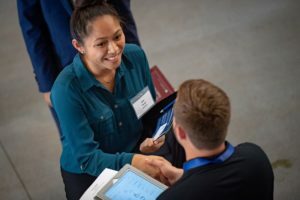 In those situations, use the conversation to learn more about the organization, and ask the recruiters or alumni in attendance if they could help connect you to someone who oversees master and phd level hiring or more experienced candidates. 6) Get business cards and send thank you notes. Even though it’s not technically an interview and might only be a 5 minute conversation, you still want to show that you appreciated their time and that you are indeed interested in opportunities with them. This will help you stand out from the hundreds of people they talked to who might not even be interested anymore. 7) The slides from a previous career fair prep workshop can be viewed here. “Speaker notes” appear on some slides in a little conversation bubble at the top left corner of applicable slides when viewed in Adobe Reader, or to the right when viewed via Google Chrome preview. 8) Advice directly from an employer recruiter can be found here. Best wishes for success at the upcoming career fair. Do you have any other tips from previous career fair experiences? Please leave them in the comments below. Need help preparing for the fair? Schedule an appointment with your graduate career consultant today.